Well, along with celiac disease, it appears as though the illustrator is also suffering from some lactose intolerance. This is not uncommon. So, we have been playing around with milk. It feels like my pantry and refrigerator have expanded with more and more products to accommodate everyone's needs! In order to keep our budget in check, we are working with what we both like. So far, the favorite is Almond Milk. The illustrator had his first bowl of non Cheerio Cheerios, also known as WholeO's by Nature's Path. He ate it with almond milk and a banana. I was so impressed...he liked it! The cereal tastes a lot like a plain rice cereal, but the addition of the almond milk really adds another level and banana is a great addition too! We both like the slightly sweet flavor and the viscosity is nice without being too thin or too thick. 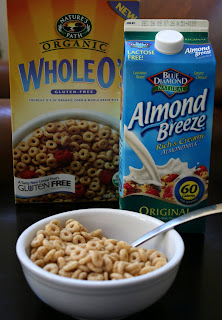 Almond Breeze is the brand that I like the most (at this point) and is my go to brand for almond milk. A friend of mine went to a co-op and brought back a couple of goodies for me. One of them was this Living Harvest Hemp Milk (they have since changed their packaging). I love this stuff! It is so rich a smooth. I baked some cornbread muffins with the hemp milk. Wow, what a nice compliment to the corn flavor! So, I decided to do something that I have never done before, but I have seen my father-in-law do it many times before...eat my cornbread with milk on it (well, hemp milk). This was so good! I highly recommend the cornbread with milk combo...pure comfort food! 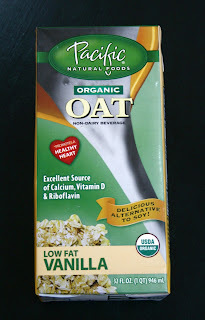 This Pacific Natural Foods Vanilla Oat Milk is one of the other treasures my friend brought back from the co-0p. This one is definitely a sweet milk! You know I love oatmeal, so really, there was no going wrong with this one. 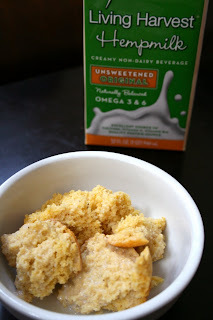 I decided to have another little oatmeal adventure and use the vanilla oat milk in some carrot cake oatmeal! So good! 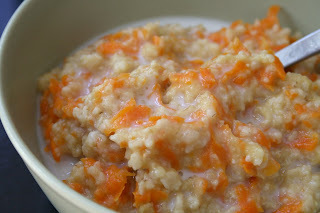 If you have never tried carrots in your oatmeal...you are missing out! I would like to play with this idea more because it will be a great fall/winter breakfast, lunch, snack, dinner or dessert. I think you get the idea that I can eat oatmeal anytime! Carrots in your oatmeal? Never thought of that and it sounds awesome! We did mashed potatoes with carrots the other night and that was a big hit! Almond Breeze is Chris's favorite (of course he likes the chocolate - tastes like yoohoo). I've been wanting to branch out to hemp milk, so I'll give this brand a try. Have you heard anything about the Tempt brand? Their hemp milk ice cream was amazing. We buy a lactose free milk. It tastes just like regular milk but none of the lactose. Hubby loves it. We also found a lactose free ice cream made from milk. I'd like to get an ice cream maker and try my hand at making it myself. Laura, I am going to have to try the chocolate one...sounds good! Linda, I wish the lactose free worked for me. I can't even have things processed in the same plant as anything with dairy! My husband is just drinking what I drink in order to save room in the fridge and the budget. That carrot cake oatmeal does look yummy! Almond Breeze is still my favorite too (we get the unsweetened original and unsweetened chocolate often when it is on sale! ), but lately, the So Delicious Coconut Beverage has been coming in a close second. I love healthy foods, but the hemp milk just isn't quite there for me. Keep up the great posts doll! OMG I am soo happy I found this blog. I am lactose intolerant and I love to see there are some other options out there. I live in Australia and the options are quite limited as aussies are high on their dairy products. But I'm heading back to the US next year and will be very happy to try the almond milk.